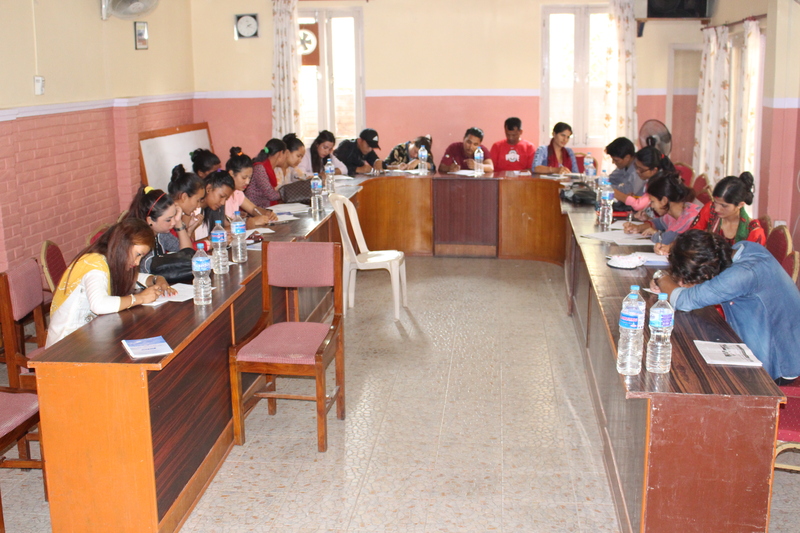 National Media Development Center (NMDC) with the financial support from Department of Information, Ministry of Information and Communications and in coordination with FNJ Lamjung branch has successfully organized a five-day Journalism Training Focused on Development Reporting. It is NMDC’s 101st journalism training was organized from 05-09 June 2017, (22 – 26 Jeth 2074) in Lamjung district. NMDC is the pioneer organization working for the rural media empowerment in Nepal. It has organized reporting trainings in 71 out of 75 districts of N epal. In total, 2418 participants including 1076 women have got reporting skill from media training. Journalism training focused on development reporting gave high priority to new as well as working reporters. 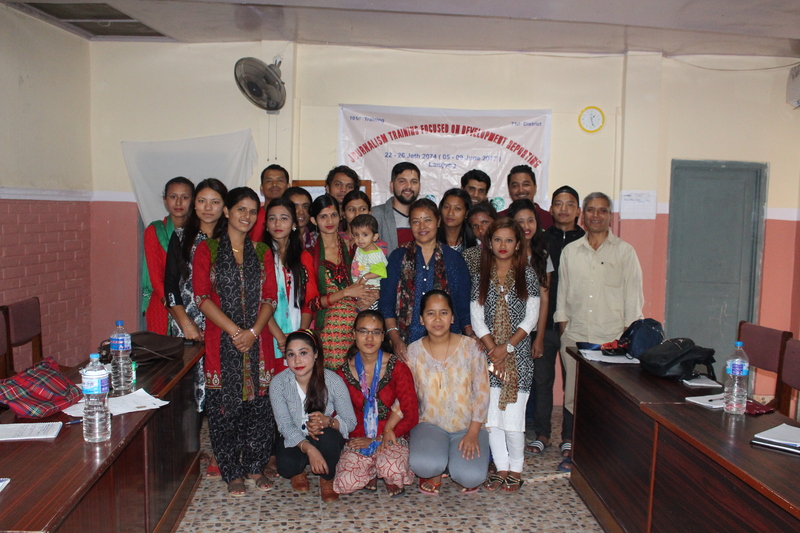 There were 20 participants including 15 women in Lamjung. Among them 11 participants were taking part in the training for the first time however all of them were involved in local print and FM radio stations. NMDC focuses on development issues aiming that after the training the trainees become aware and able to bring development issues rather than political. In the context of Nepal, the present need is economic development, which is backbone of democracy and independent media. The training became fruitful to all participants, as they clearly understood the theme of the training and participated actively in all sessions. For the first three days, the course covered the principles of basic journalism, news identification, news writing, experience sharing, field reporting and presentation together with the concept of development reporting. In other days, it focused on writing skill, interview skill, and other dimensions of development reporting. The issues apart from journalism principles and reporting techniques covered in the sessions were new media-Facebook, Flicker, Blog, Twitter, Google search, Google mapmaker, development, tourism, culture, district profile and economic reporting and code of conduct for the journalists. Together with several class exercises, presentation and news writing, one field reporting assignment had provided a great practical knowledge and confidence to the reporters. They had told that the field reporting assignment had inspired and gave them a clear idea to be a reporter. Even in a short period, they had become able to recognize and identify issues, categorize issues and write them on day-to-day journalism practice. They also have learned that journalists should keep in mind the code of ethics for journalists. FNJ President Aash Gurung had chaired the inaugural session. Inaugurating the training session, he welcomed the trainers and participants and asked them to take maximum benefit from the senior trainers, which is rarely available in the country. Chief District Officer Yubaraj Mainali inaugurating the five-day training highlighted the need of training for fact based journalism. 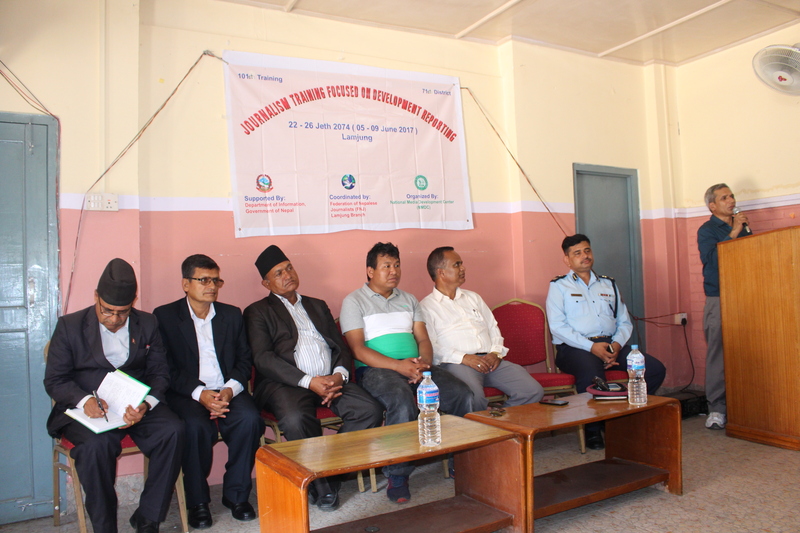 At the inaugural session Mayer of Beshisahar Municipality Guman Singh Aryal, Local Development Officer of District Coordination Committee (DCC), Dilliram Sigdel, leaders of media organizations and political parties had also expressed about the need and importance of training. Trainer Badri Tiwari, FNJ Central Committee member Kisan Sangit Nepali, former President Nabinraj Kuikel were also present at the session. Bishnu Prasad Sharma, Executive Director of NMDC welcoming on behalf of organizer, Department of Information and FNJ had highlighted the content, objective of the five days training. At that time, he briefly informed the rural district focused training programs organized by NMDC has provided writing skill to the reporters and encouraged them to be professional reporter. He also said that the training would be beneficial to both new and working journalists that will help to bring development isuues at local level. 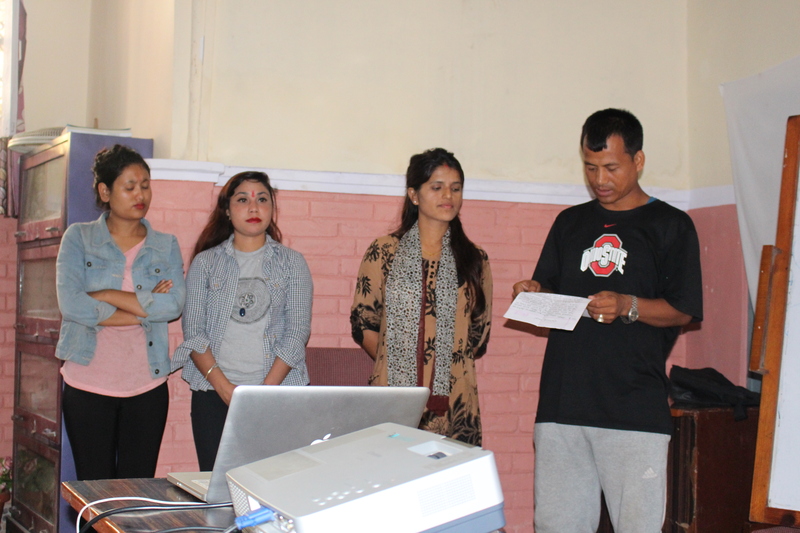 Badri Tiwari, Bishnu P Sharma, Aash Gurung, and Dilliram Sigdel had facilitated the training. NMDC had distributed both pre and post training questionnaires by involving trainees. The concept they had mentioned in the form had shown that the training was successful to transfer basic skill to the participants. In five days, there were different sessions. At the end, a brief closing session had also been organized in participation with senior journalists, DCC, FNJ members, and local journalists. FNJ President Aash Gurung had chaired the session. 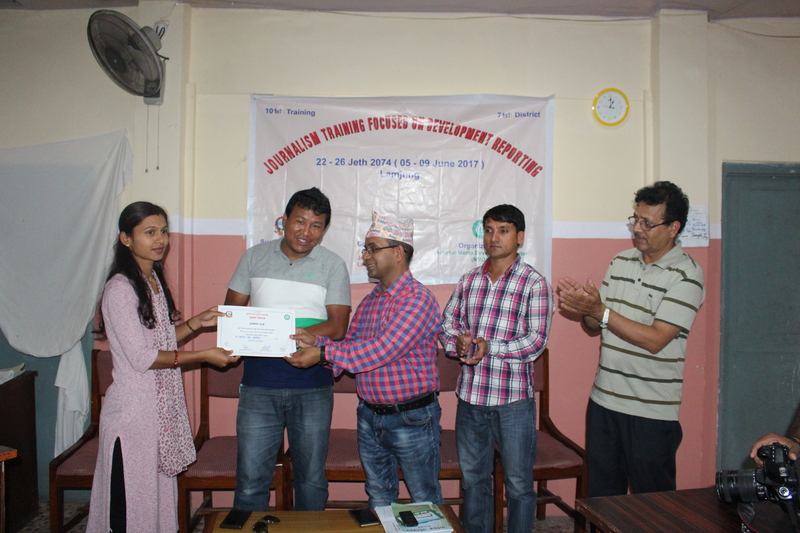 Dilliram Sigdel from DCC distributed the certificates to the participants. Basanta Bhatta participanthad expressed their training experience. She said the training had developed their confidence and encouraged them to be good journalists.